My junior year of high school was the last year I would play competitive baseball. As the season came to a close, I sat in the last row of the team bus on a return trip from a game that was played three hours away. I had the scorebook on one knee, and a piece of paper and pen on another. Page by page, diamond-filled square by diamond-filled square, I went through the book and tallied my batting average, runs batted in, errors, and a slew of other baseball stats. The tedious process took the entire ride back, yet it felt like time well spent. I knew where I did and didn’t contribute to the team throughout the season, and was able to confirm I was in the midst of the best season I’d ever had. But I was the only one that knew any of this, as I was the only one that actually took the time to go through the book. That bus ride is the first thing that came to mind as I got off the phone with GameChanger CEO Ted Sullivan. 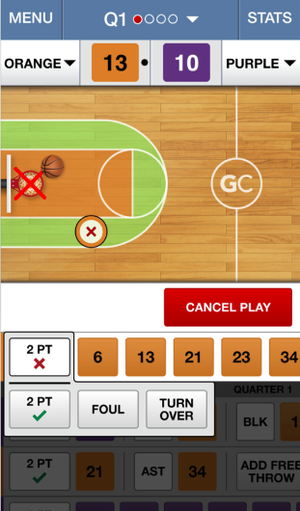 GameChanger is a free app for iPhone and iPad that offers a digital alternative to the paper scorebook long used for sporting events. On the surface, GameChanger appears to be nothing more than a digital scorebook. The app replaces the sloppy stack of bound paper sitting on the scorer’s table at a basketball, softball, baseball, and (soon) lacrosse game. Tap here for a base hit. Touch there for a wild pitch. Press here and here to log a foul and count the basket. Stats are automatically calculated in real-time and provided to anyone who follows a team or player. “If only this technology existed when I played sports,” I thought, while going over the app for the first time. Besides baseball, you can track basketball and softball games, too, with lacrosse coming soon. But there’s much, much more to the app than just compiling statistics. Sullivan estimates that scoring at 95 percent of amateur games is done using pencil and paper. And what’s more, most of the score keeping is left up to volunteers. From my experience, many volunteers often don’t fully understand how to properly score a game, leading to incorrect statistics—a fact that can have an impact on the dreams of young players who hope to play in college and beyond. GameChanger aims to be “collector of all in-game amateur sports data,” according to Sullivan. By eliminating the learning curve of how to properly score a game through prompts, the data Sullivan wants to collect is easier to record and more likely to be accurate. 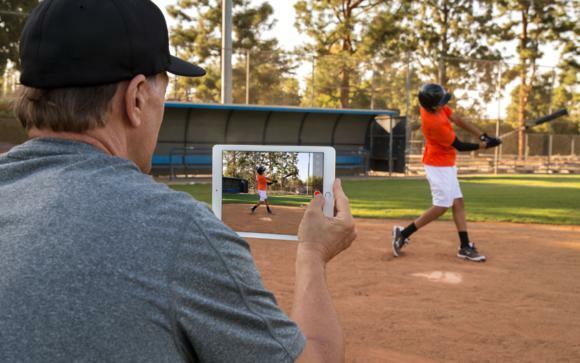 Statistics and scouting reports aside, perhaps the most powerful aspect of GameChanger is that it allows for a parent to follow a child’s game—in real-time—should he or she be stuck at work, overseas, or anywhere with an internet connection. Take the game alerts you’ve long associated with your favorite sports app, and apply that to your child’s little league or high school game. You can receive a text alert when Katie gets a base hit, then congratulate her using FaceTime after the game without waiting to hear how the game went; you already know. Or if the game didn’t quite go Johnny’s way, you can offer encouragement without forcing him to detail how bad of a game it really was. I talked with Dwight Schmidt, a baseball coach, Marine, and airline pilot who has used GameChanger for the last six years. He was able to address the experience as both a coach, and a parent of young athletes. Schmidt told me as a coach he’s able to “keep tabs on pitch counts to combat Tommy John injuries,” along with ensure he is playing all kids fairly. He also uses GameChanger stats to pinpoint areas for each player to work on improving. Best of all, the information is available as soon as it’s entered. He no longer has to spend hours combing through a “paper scorebook with [a] stubby pencil and eraser” to compile the stats on his own. As a parent, he’s powered up his iPhone in South Korea or Afghanistan and received alerts from both of his sons’ games—something that meant a lot to him, and understandably so. My kids aren’t old enough to follow within GameChanger, but I did follow some teams who use the app. I watched a live game in Georgia, and was mesmerized by the game updates constantly updating within the app. At times there was a bit of a delay, which was followed up by a rapid stream of what had occurred. But overall, you get the general idea of what’s going on in the game beyond what the score is. After the game is over, GameChanger processes the stats from a game and creates a newspaper worthy recap, that is then emailed to paid followers of a team. GameChanger is free for coaches, who can then add two additional admins to the account. The three accounts combined can keep scores and have full access to a team. Parents can sign up and become a “fan” of a team for free, with access to live scores. If you want to receive live updates and in-depth stats, you can sign up for a monthly plan of $40 per year, or $8 a month. I often talk about my jealousy towards the current generation growing up with access to technology I could have only dreamed of when I was younger. GameChanger is a prime example of my jealousy. Instead of sifting through page after page of barely legible handwriting in a scorebook managed by a freshman volunteer on the bus ride home, I could have only dreamed of launching an app on a contraption called an iPhone and viewing my stats. Who knows, maybe a scout would have taken notice of the season I was having and encouraged me to keep playing.